Being a superhero, Robin has an advantage that normal people don’t — namely superhuman detective skills and kung fu-ing faces. With his classmate dead, it’s time the teenage murderer pays for his crimes. Through kung fu-ing him in the face, mainly. 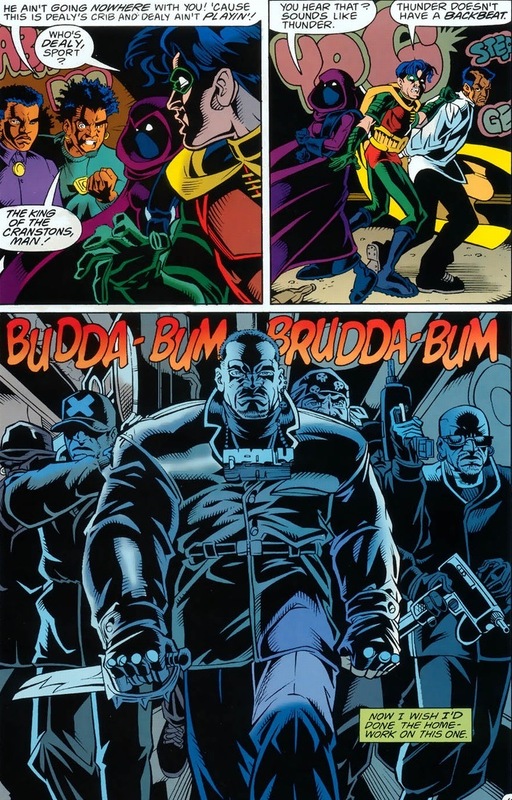 Robin and his buddy Spoiler have all the information they need, and all that’s left is the bruising and the arresting. 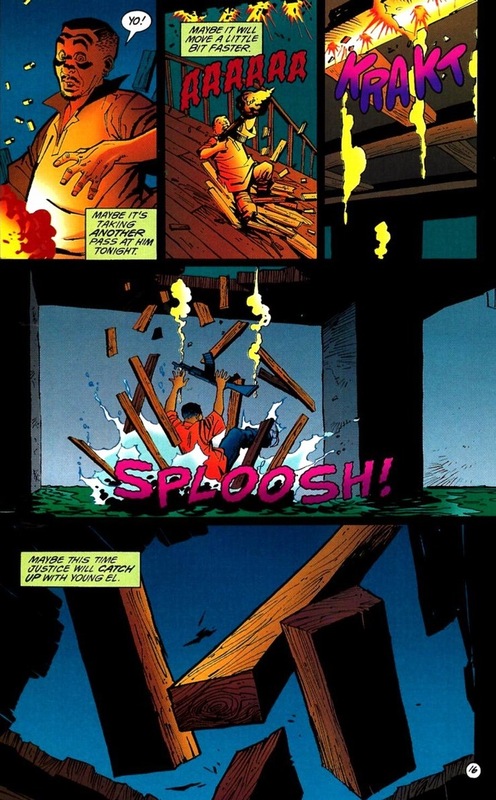 I’m not totally an expert on teenage behavior, but two colorful vigilantes bursting through a gang’s door invokes less fear and more apathy. We forget that Batman’s the scary one. 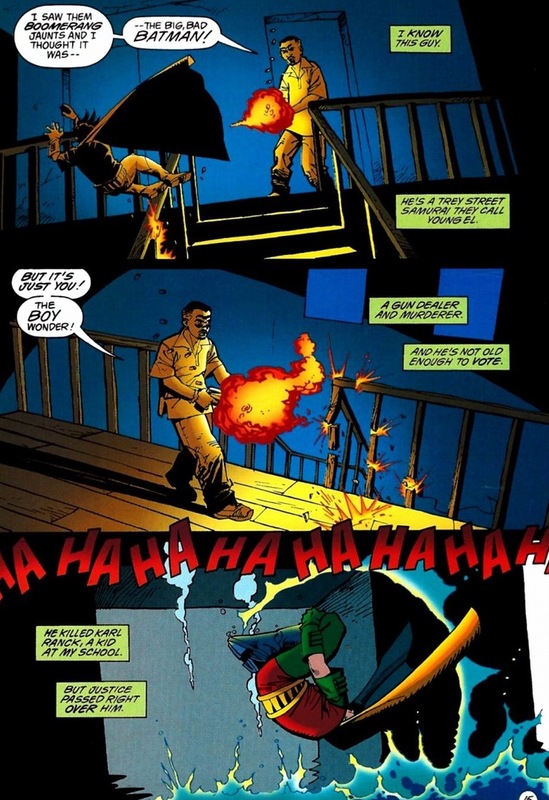 Robin’s the lighter side of crime fighting. 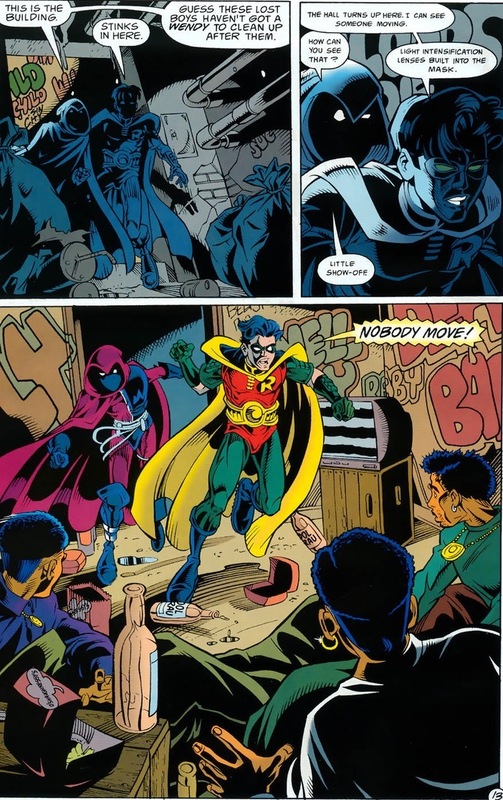 Since children can’t be as frightening as Batman hopes, Robin’s bright colors allow the bad guys to underestimate him. He wins the fight through psychology. 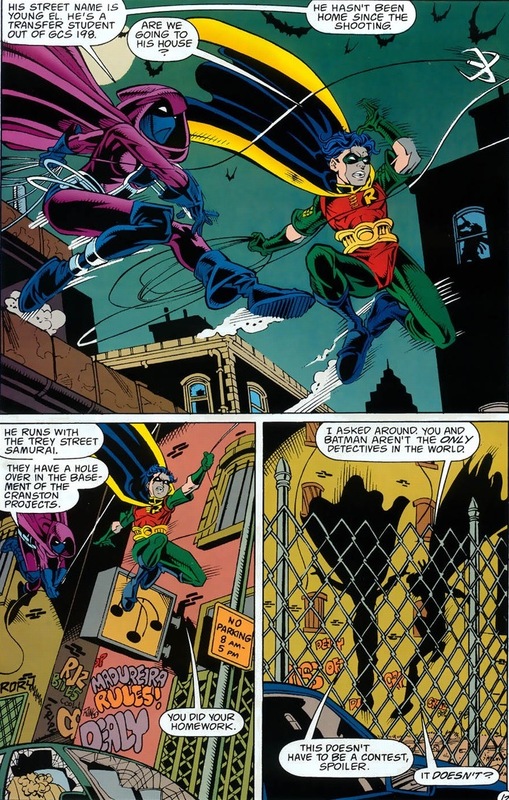 Or because Robin’s color scheme has been around for over 70 years and it’s too late to make any considerable changes to the costume. Giving Robin pants were a nice touch though. Daddy has a lecture planned. I know in the movies, they always show Batman’s eyeballs, but the white slits make for a wildly more intimidating Batman. Time for Robin’s life lesson this arc. 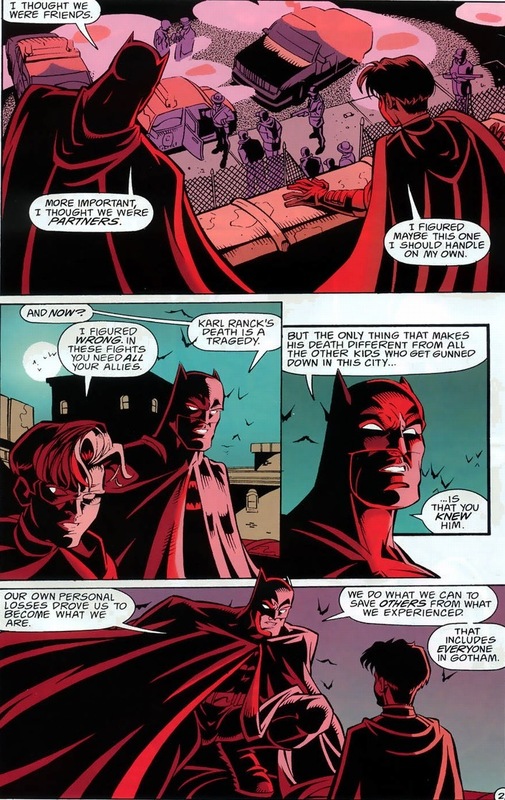 Batman’s right, of course, except for one tiny detail — the whole fear of Batman prevents crime thing. 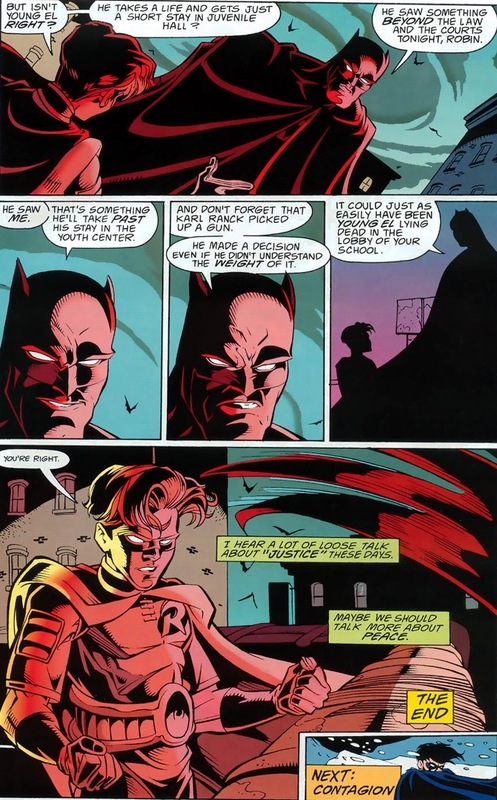 Maybe in a real life society, a giant man in a bat costume dropping from the sky to punch all your friends would give you some hesitation before committing the next illegal act. But Batman lives in a world where he needs stories to fill four or five monthly books — Gotham isn’t lacking in repeat offenders. We pick up twenty issues later. Bad guys continue to rob banks and steal and kill and poison the water supply and tear people in life while wearing luchador masks. 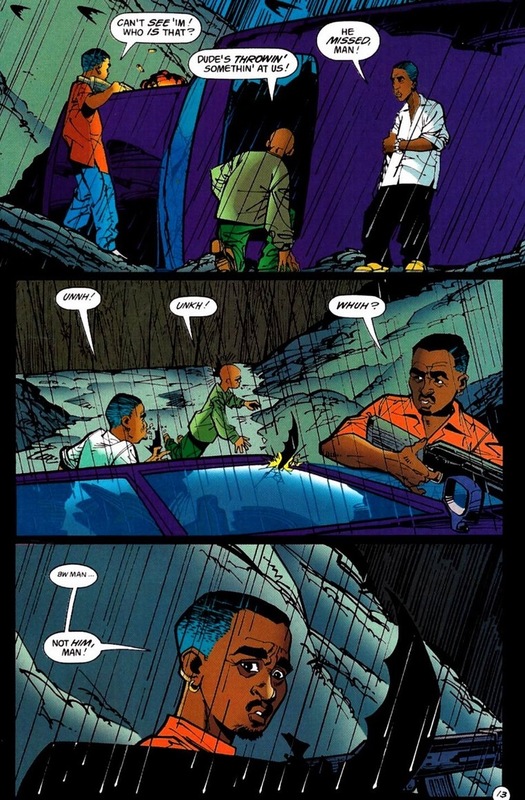 But today, we get the conclusion to Robin and Young El’s tale. One of them didn’t learn the first time. See? What a great dilemma! 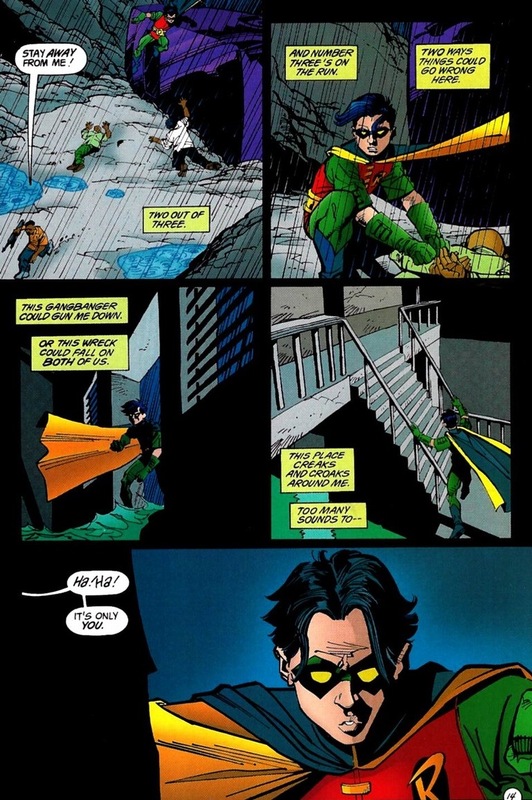 Young El will need Robin’s help to survive his mistake, but Robin will be assisting a known murderer — and a personal tragedy in Tim Drake’s life — only to have Young El break the law later down the road again. 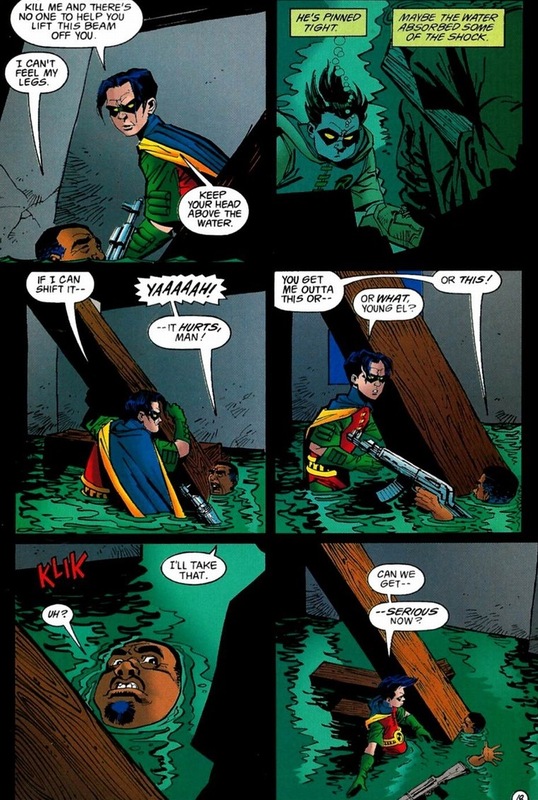 While people rave about characters who “put down” their villains, of course Robin’s going to attempt to save Young El. He’s better than us. 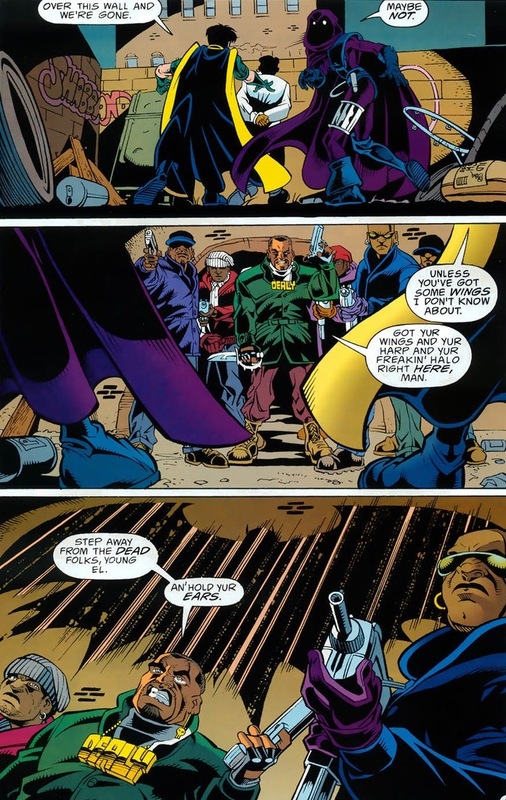 Batman’s better than us. 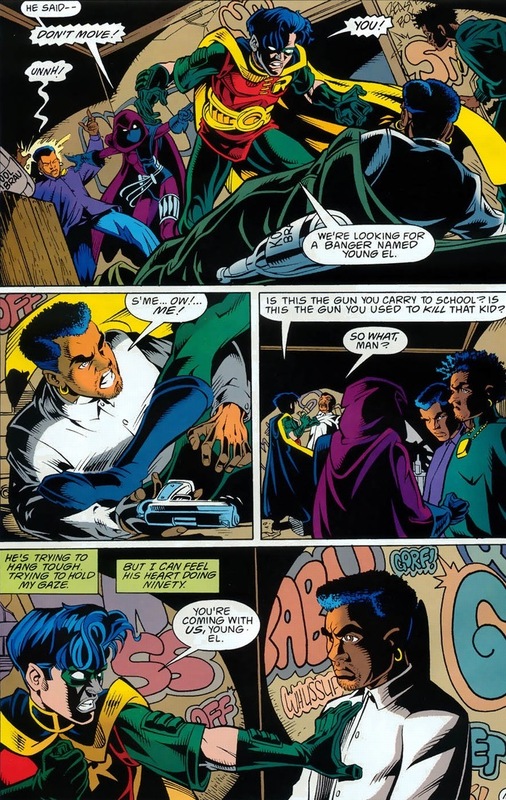 Superheroes have to be morally superior, as it goes with the cape-and-underpants territory. 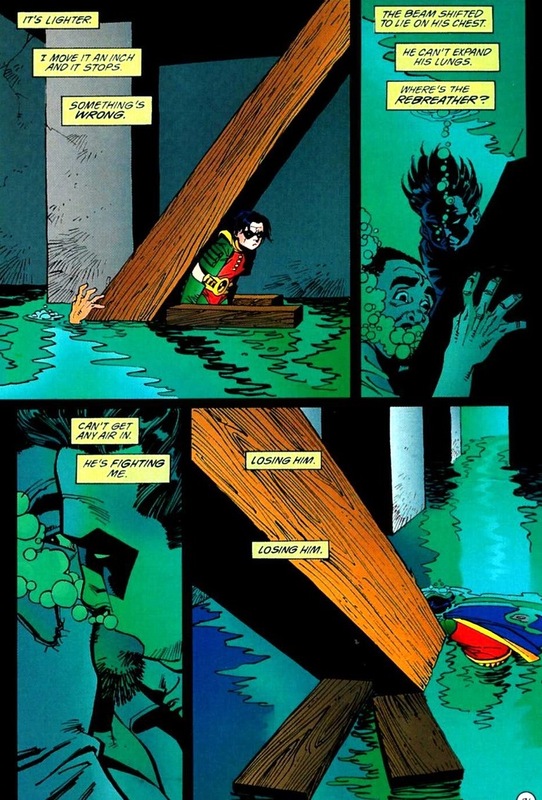 We end our Robin stories today, and like the other two articles, this one also ends unhappily. That child gets wrung through the emotional ringer. 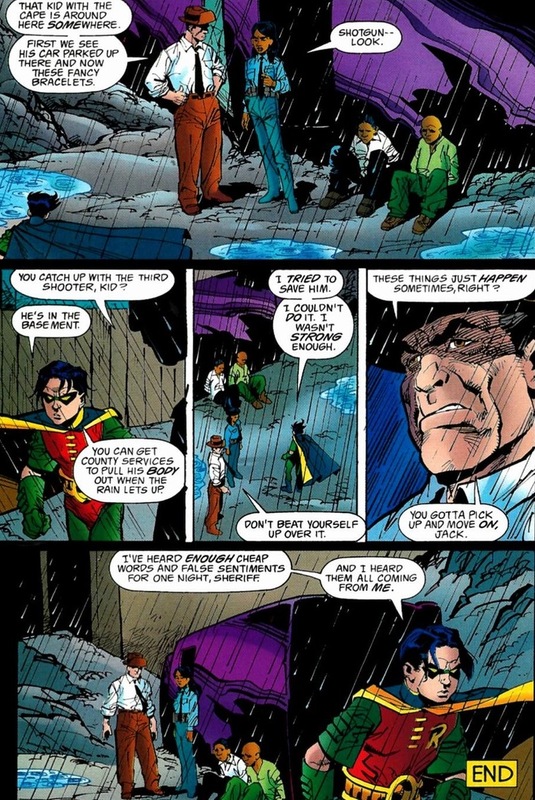 Thank goodness poor Tim has the composure to suppress or deal with trauma (and it certainly helps that he’s a fictional character) or else his father wouldn’t need to find the costume to discover Robin’s secret identity — he’d just have to listen to the daily night terrors and massive therapy bill. 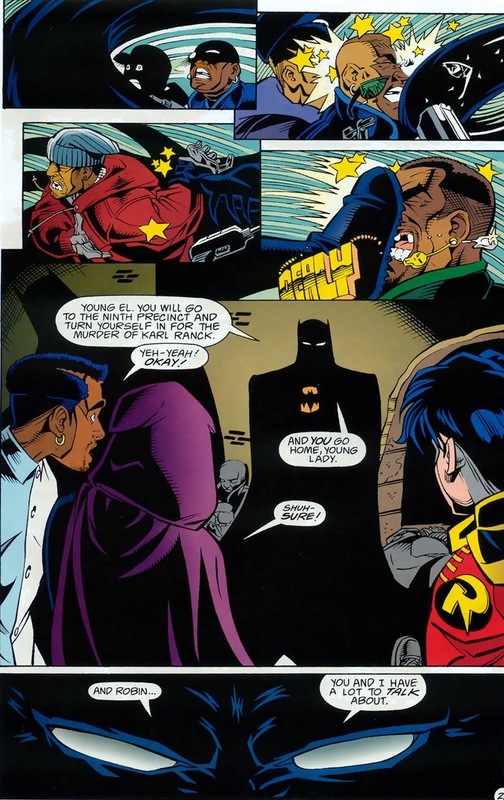 In summary, Tim Drake’s the best Robin. I think that’s the message I’ve tried to convey this week. Don’t worry, Robin’ll smile on Monday as we cover an Impulse moment from Teen Titans. 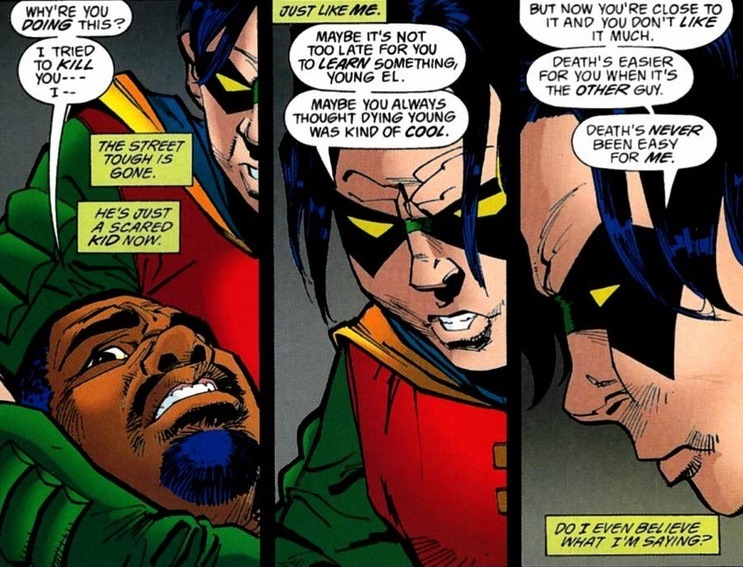 Young El suffered a fate worse than death: getting to second base with Tim Drake. 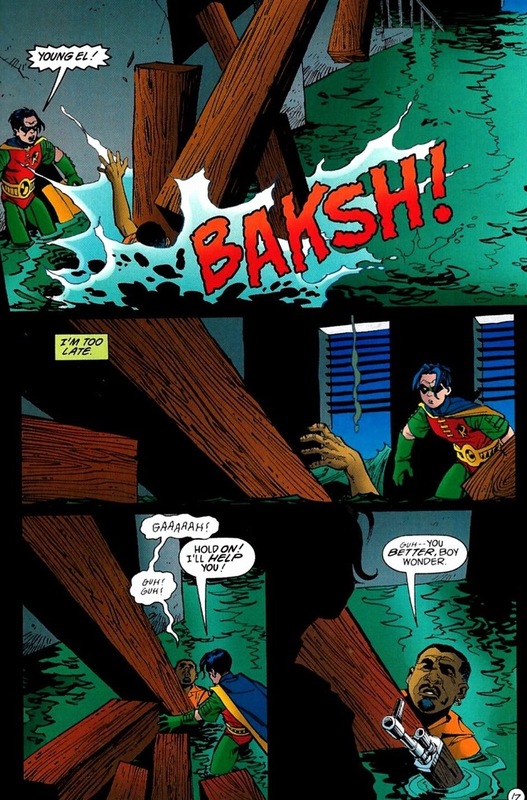 Oh yeah, his last moments on Earth are him making out with Robin.